The call for conference proposals is now closed. The 2nd International Conference on Disability Studies, Arts & Education will be hosted in Philadelphia (United States) at Moore College of Art & Design. Beginning Thursday, October 3, and ending Saturday, October 5, 2019, the 2nd International Conference on Disability Studies, Arts & Education will bring together researchers, students, artists, art educators and members of the disability community who share an interest in, or whose work addresses, the intersections and interplay between critical disability studies, arts, and education. $50 for the full event / $35 per day / $10 discount for all Students, National Art Education Association DSAE, & SNAE Interest Group Members and Council for Exceptional Children Division of the Arts members. Registration for this conference is now open! The Conference will comprise various art forms, such as visual arts, performing arts, dance, and film, as well as different contexts of education, such as primary education, higher education, professional artists’ education and public pedagogy. The members of the organizing committee are: Lauren Stichter (conference chair), Mira Tavin-Kallio, Amanda Newman-Godfrey, Rhoda Bernard, Jeremy Johnson, Juli Dorff, Veronica Hicks-Daley, Jenna Gabriel, Elizabeth Clay and Samantha Varian. 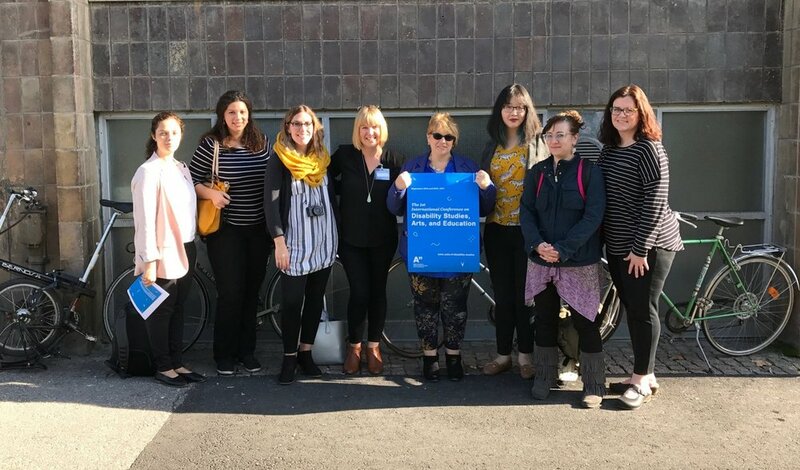 While this international event is not sponsored by The National Art Education Association (United States), the conference was founded and continues to collaborate with members of the NAEA Disability Studies, Arts and Education interest group. New partners this year include members of the NAEA Special Needs in Art Education interest group. The NAEA Disability Studies, Arts and Education interest group was founded in 2017. This group was created to provide a network for art educators to share their interests in the interdisciplinary field of disability studies as it pertains to the field of art education; to encourage cross-cultural and interdisciplinary research and professional relationships to promote theory and practice that respects disabled peoples as cultural groups; to engage research and teaching interests within NAEA that embrace the critical, interdisciplinary field of disability studies. Established 2001 as a special interest group in the National Art Education Association (NAEA). Our purpose is to promote art education for learners with special needs through professional development, educational collaboration, advancement of knowledge, and leadership. This conference brought together researchers, students, artists, art educators and members of the disability and crip art communities who shared an interest in, or whose work addressed, the intersections and interplay between critical disability studies, arts, and education. The scope of the conference comprised various art forms, such as visual arts, performing arts, dance, and film, as well as different contexts of education, such as primary education, higher education, professional artists’ education and public pedagogy. The members of the organizing committee were: Mira Kallio-Tavin, John Derby, and Mikko Koivisto. Click HERE for the 2017 DSAE Conference website. Click HERE to see the 2017 DSAE Conference Session Titles. DSAE provides a network for art educators to share their interests in the interdisciplinary field of disability studies as it pertains to the field of art education; to encourage cross-cultural and interdisciplinary research and professional relationships to promote theory and practice that respects disabled peoples as cultural groups; to engage research and teaching interests within NAEA that embrace the critical, interdisciplinary field of disability studies. Powered by Squarespace. Images provided by www.visitphilly.com, Aapo Raudaskoski and Jani Nummela and Moore College of Art & Design.